Reiki (ray-key) is Japanese for ‘universal life energy' and is used to describe a system of natural healing. This tradition was founded by Mikao Usui in the early 20th century and evolved as a result of his research, experience and dedication. We live in a world of energy that nourishes and maintains all living things. When this energy flows uninterrupted there is balance and harmony within and around us, and we experience a sense of well being. There are many variations of Reiki, but in essence Reiki sessions can help the body physically, emotionally or spiritually. It is a tradition that is open to any belief system. Reiki can be used alongside other conventional or complementary treatment. The client remains clothed and lies on a couch or sits on a chair and relaxes. The practitioner gently places their hands in a series of non-intrusive positions on or near the body. There is no massage or manipulation. The whole person is treated rather than specific areas. Sessions can take 45 to 60 minutes, depending on the client’s needs. Each person experiences Reiki differently depending on their individual needs at the time. Clients may or may not feel sensations during a Reiki treatment. Benefits reported include deep relaxation promoting a calm, peaceful sense of well being on all levels. Some people feel sensations of heat, tingling, or experience seeing colours, whilst others can have an emotional response, indicating that shifts are taking place, allowing harmony to be restored. 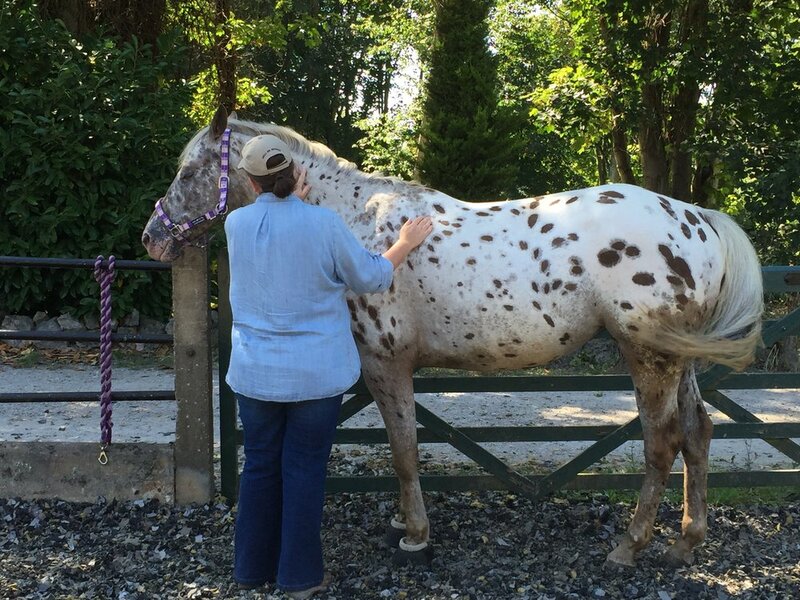 Reiki sessions are provided for both horses and humans, either in person or by distance, for overall wellbeing. Reiki is provided for the overall wellbeing of the horse and not to treat any specific issues. You should seek the consultation of your veterinarian should your horse(s) be unwell. The following is taken from The Reiki Council: "Reiki is a procedure that would not normally be regarded as the practise of veterinary surgery under the Veterinary Surgeons Act 1966; though it would be prudent for animal to have been seen by a veterinary surgeon when this is being performed for reasons other than well-being." In-person sessions are offered at your home or office. In-person sessions for you and your horse. If you would like to book a reiki session, please fill in the Booking Form below and Nancy will be in touch with you to schedule your appointment. If you would like to book an appointment for a reiki session, please complete the form below.